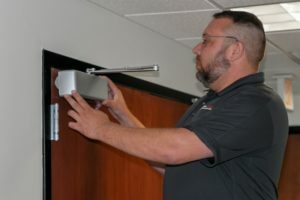 Inspections are critical, but they are only the first step toward fire door compliance. Fire Door Solutions offers an efficient and effective turnkey solution for both inspections and repairs. Our knowledge gained during the inspection process helps us estimate repairs quicker and more accurately, and engineer more cost-effective solutions. Instead of having to study and translate someone else’s work, Fire Door Solutions can immediately begin repair work and get you to full compliance quicker and for less money. Fire Door Repair Technicians are trained to repair door deficiencies first; not replace items unless necessary for compliance to NFPA 80. We can order parts or use parts out of your inventory, further reducing your cost of repairs. Our Fire Door Solutions Caulk, Gap Gauges, Thru-bolts, and Shims are used to repair the following list of deficiencies. Any tools and supplies remaining from this Fire Door Solutions Repair Kit are left for you to use in case a between-inspection repair needs to be made by your Facilities Team. Of course, Fire Door Solutions is at your service if you prefer we do interim repairs as the need arises. Inspections verify the integrity of gasketing and edge seals, where required. Insure nothing is lost in translation between companies and leverage the knowledge gained by our Inspection Team.